Employment Discrimination Coordinator (EDC) provides comprehensive legal analysis and guidance on employment discrimination and wrongful discharge. Biweekly updates cover state and federal discrimination laws in both public and private employment, as well as all aspects of wrongful discharge law. EDC contains a state-by-state analysis of unjust dismissal issues, areas with significant differences between state and federal law, the newest legislation and latest changes in federal and state regulations, underlying rules on employment discrimination, and citations to controlling authorities. No binder contains more than one Topic. Within each binder are tabs that break down the Topic into its major Parts. There is a Table of Contents at the front of Volumes 1-7. Volumes 4 and 5 provide a similar analysis, except the focus is on the 50 states and other U.S. jurisdictions. The analysis begins in volume 4 with an overall summary and comparison of the laws in each state. Following that there is a state-by-state analysis of the various employment discrimination laws that are operative in each individual state. 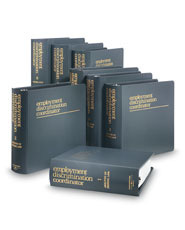 Volume 7 includes forms, pleadings and other aids for the practice of employment law.